One of the great names among the Rio Grande Valley artists, Alfred Aguilar is a guardian of local tradition. 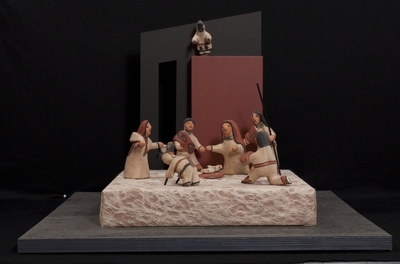 His nativity sets are a marriage of Christian and pre-Christian customs. Among the typical gifts brought to the manger are pots and drums. Aguilar adds the traditional Indian wedding shawl. The wedding shawl brought as gift to the manger is a most appropriate symbol of unity and complementarity. The two stick dancers, representing deer and antelope, highlight honor and praise due to the Christchild. Glazed, clay figures sculpted in 1999 by Alfred Aguilar in the Rio Grande Vally region of the United States. Exhibition label originally written by Fr. Johann G. Roten, S.M. for exhibit entitled "At The Manger" and held at Roesch Library, University of Dayton.